English: Red-headed weaverfinch; French: Amadine à tête rouge; German: Rotkopfamadine; Spanish: Capuchino de Cabeza Roja. 4.7-5.1 in (12-13 cm). One of the more robust estrildids. 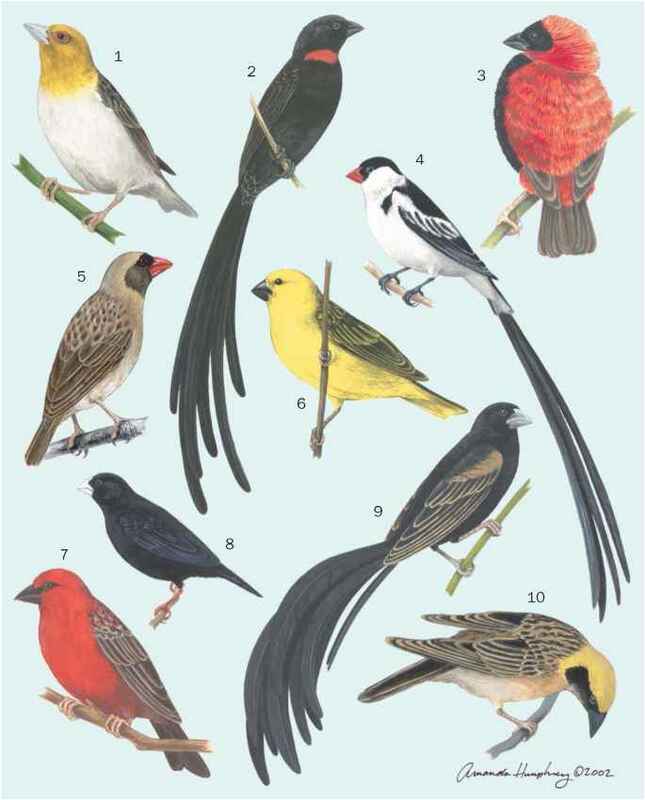 The red-headed finch, as its name implies, has a bright, blood red head. Lores are buffish. The lower throat through the belly is marked with black and white scalloping with some chestnut feathers in the middle belly and then off-white in the lower belly areas. Females lack red on the head but may carry a few red feathers. Juveniles are a paler version of the female. Southwestern Angola, east to western Mozambique, south to South Africa. Inhabits semi-desert, savanna, dry grassland, thorn scrub, and the edges of cultivated and inhabited areas. Found in small flocks. The call is a "chuk, chuk" or, while in flight, a "zree zree." The song is a series of soft buzzing notes. This species both walks and hops as it feeds on the ground on a variety of seeds and insects. This species uses old nests of weavers (e.g. sociable weaver [Philetairus socius]) or sparrows, or sometimes holes in buildings. Three to eight white eggs are incubated for 12-14 days. Occasionally kept in zoos and aviaries but not nearly as commonly as its relative the cut-throat finch (Amadina fasciata).